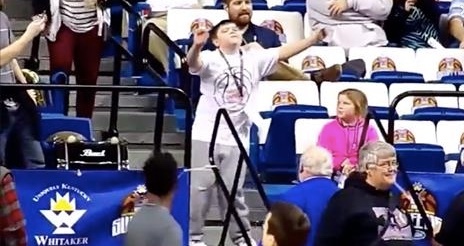 Kid Started Dancing In The Stands— Crowd Takes Notice & Can’t Get Enough! The moment that Pharrell William’s ‘Happy’ was released, it had people all over the world singing, dancing, and clapping along. The positive, uplifting tone of the song just makes you want to move your feet. Those are the positive lyrics of the popular song; a kid watching a Kentucky High School basketball tournament couldn’t help but bust out a move when the song started playing over the speakers. Ladies and gentlemen, remember the name Peyton “Peanut” Henderson because he’s a person that all of us should try to emulate daily. He dances with reckless abandoned. Peanut could care less who is watching him shake that booty to the hit song. At first, people weren’t noticing him get down to the Pharrell song; but soon? His dancing is taken to the next level. Continue to the next page to watch his awesome dance moves! Very good. I love that song. I’m clapping for him, too!!! He’s a great dancer and put a smile on my face. We should all dance and not care who’s watching. Dance like no one is watching!!! You nailed it kid!! Good for you young man ! We need more young people like you in this country to inspire! Don’t ever change ! Awesome!!! We need more of That!! !